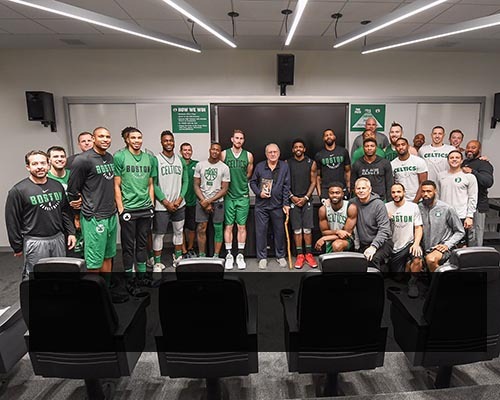 Now ninety, Bob Cousy, the Hall of Fame Boston Celtics captain who led the team to its first six championships on an unparalleled run, has much to look back on in contentment. But he has one last piece of unfinished business. The last pass he hopes to throw is to close the circle with his great partner on those Celtic teams, fellow Hall of Famer Bill Russell, now 84. These teammates were basketball's Ruth and Gehrig, and Cooz, as everyone calls him, was famously ahead of his time as an NBA player in terms of race and civil rights. But as the decades passed, Cousy blamed himself for not having done enough, for not having understood the depth of prejudice Russell faced as an African-American star in a city with a fraught history regarding race. Cousy wishes he had defended Russell publicly, and that he had told him privately that he had his back. He confided to acclaimed historian Gary Pomerantz over the course of many interviews that at this late hour, he would like to make amends. At the heart of this story is the relationship between these two iconic athletes. In a way, the book is also Bob Cousy's last testament on his complex and fascinating life. As a sports story alone it has few parallels: A poor kid whose immigrant French parents suffered a dysfunctional marriage, the young Cousy escaped to the New York City playgrounds, where he became an urban legend known as the Houdini of the Hardwood. The legend exploded nationally in 1950, his first year as a Celtic: he would be an all-star all thirteen of his NBA seasons. But even as Cousy's on-court imagination and daring brought new attention to the pro game, the Celtics struggled until coach Red Auerbach landed Russell in 1956. Cooz and Russ fit together beautifully on the court, and the Celtics dynasty was born. Yet to Boston's white sportswriters it was Cousy's team, not Russell's. As the civil rights movement took flight, and Russell became more publicly involved in it, there were some ugly repercussions from the community, more hurtful to Russell than Cousy feels he understood at the time. The Last Pass situates the Celtics dynasty against the full dramatic canvas of American life in the ‘50s and ‘60s. It is an enthralling portrait of the heart of this legendary team that throws open a window onto the wider world at a time of wrenching social change. Ultimately it is a book about the legacy of a life: what matters to us in the end, long after the arena lights have been turned off and we are alone with our memories. As he prepares for what he calls the “big basketball court in the sky,” Celtics great Bob Cousy compiled a list of items he’d like to accomplish while his mind is still sharp, his memory still keen, and his regrets still piercing. A few years ago, Cousy, 90, said he decided to research more about race and social issues and he read the Ta-Nehisi Coates book “Between the World and Me,” which is a letter from the author to his son about how to survive and cope with being African-American in the United States. On the court, Boston Celtics legend Bob Cousy was known for his "unshatterable poise." When he led his team's famed fast-break, he handled the ball with such ease that one observer said it "seemed to have wings and a homing device." But there was one basketball moment where Cousy lost all sense of control. He couldn't talk. He choked back sobs. He covered his face with his outsized hands to mask his shame. 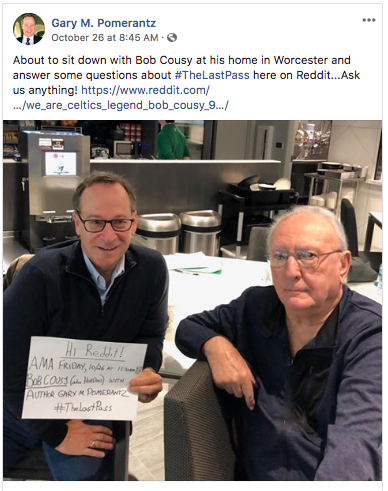 It's rare in America for a 90-year-old white man to reconsider race and how it played out in his own life, but that's what Cousy is doing Gary M. Pomerantz, author of "The Last Pass" It came while he tried to explain his relationship with his legendary teammate, Bill Russell. WORCESTER, Mass. -- Bob Cousy figures he's running out of time. The brilliant Hall of Fame point guard, who was so deft and creative with the basketball that he was nicknamed Houdini of the Hardwood, is 90 years old. He walks with a cane, and, he tells ESPN, he expects it won't be long until he needs a wheelchair. 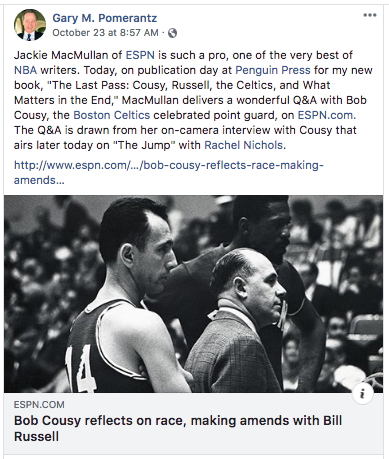 The reflective Cousy is the centerpiece "The Last Pass," of a new book by Gary Pomerantz that chronicles Cousy's journey toward racial self-discovery and his attempts to make amends with Hall of Fame teammate Bill Russell for not being more supportive during the racially charged '60s. On a cold autumn morning, Bob Cousy greets me at the front door as the leaves fall around his home in Worcester, Massachusetts. He’s lived there alone since his wife died five years ago. I shake his hand and ask him how he’s doing. “Never ask a 90-year-old that question”, he says. He brandishes his cane for emphasis. Q: How did you come to write a book about basketball and in particular the Boston Celtics? A: I had just published a narrative called Their Life’s Work about football’s great dynasty of the 1970s, the Pittsburgh Steelers. That was a story about football’s gifts and costs. I started thinking, What if I examined another great sports dynasty as a way to take on the evolving tenor and tone of American sports during the 20th Century? I considered baseball’s New York Yankees of the 1920s, 40s and 50s, and basketball’s Boston Celtics, who between 1957 and 1969 won an unmatched 11 NBA championships in 13 seasons. Nearly all of those long-ago Yankees had died, but most of the Celtics’ Hall of Fame players were still around, including Bill Russell, Bob Cousy, Tom Heinsohn, John Havlicek, Sam Jones, K.C. Jones, and Satch Sanders. I had interviewed the Celtics’ coach Red Auerbach in 2003, a few years before his death. Auerbach was a colorful curmudgeon, an authentic period-piece character. I thought, Maybe I can capture those Celtics in their twilight years? Q: It is Bob Cousy, however, who emerges as the focal point of the book. How did this happen? A: After my first interview with Cousy, I made an editorial decision: the story to tell was his. I met him at his house in Worcester, near Boston. Our interview lasted four hours. I probed and challenged. He engaged and was engaging. He laughed. He thought deeply. He wept about his late wife. His intellect was sharp, his emotions close to the surface. He had much on his mind, and in his heart, particularly about Russell, his African-American teammate who had endured intense racial prejudice when they played together on those storied Celtics teams. There was something uncommonly deep and moving in what Cousy had to say. Over time this evolved into a story about an old man coming to terms with his life. Q: What was Cousy like to interview? A: Candid, honest, intense, contemplative, emotional. He was all-in every time. At 90 years old, Cousy lives alone in a big house in Worchester, MA filled with echoes and memories. His wife Missie died five years ago and their grown daughters moved away many years ago. He has the time, space, and intellectual capacity to think deep thoughts. We conducted 53 interviews in all. I made trips to Worcester and conducted a series of interviews during each visit. One day we sat in his living room, the next day on the enclosed back patio, and so it went. Later I traveled to West Palm Beach where he spends winters. Many of our interviews were done by telephone. Every few weeks we talked. Sometimes he wrote me a letter or a note. Or he’d leave a message on my answering machine saying he’d been thinking about our last conversation and had more to say. It became a continuing dialogue that spanned 2 ½ years. Q: What is Cousy’s legacy to basketball? During the early 1950s, he saved the pro game from general disinterest just as Wilt Chamberlain would save it in the early 1960s, and Magic Johnson and Larry Bird in the late 70s and early 1980s. Those four players had unique skill sets and personalities. Fans responded, and the game lifted. Cousy’s imagination and theatricality on the court live in the soul of today’s NBA. The self-expression in the playing styles of players such as Steph Curry, James Harden and Russell Westbrook – the way they run the break, dribble, distribute, and throw no-look passes – Bob Cousy is the progenitor. Certainly today’s game is more refined, stylized, and talented than ever. But it’s that self-expression – basketball as free flowing art – that draws us in. And all of that flows historically through Cousy. Q: In the book you talk about the many things Cousy did to better the game on the court. Can you tell us a little more about what he did off the court? A: Cousy cared about the welfare of the game, then and now, as much as any NBA player ever has. He founded the NBA players union during the 1950s. Today, the average salary for an NBA player is about $6 million, higher than the averages in major league baseball and the NFL. The decimal point has moved three places since Cousy’s day: Cousy earned a $35,000 salary in 1963, his final season with the Celtics, and LeBron James earned about $35 million last season. During his playing days, Cousy made several trips abroad with Auerbach – to Europe, Africa and Asia – as basketball ambassadors sponsored by the U.S. State Department. They gave lectures, held clinics, showed films of the Celtics fast break. Those trips were instrumental in popularizing the game around the world, and bear fruit today: A record 108 players from 42 nations and territories made opening-night NBA rosters for the 2017-18 season. Cousy served as president of the Naismith Memorial Basketball Hall of Fame, which curates the history of the game. He was an NBA head coach in Cincinnati for several years, and a TV broadcaster for Celtics games for 34 years. Q: Bill Russell joined the Celtics in December 1956. His arrival marked a turning point for the team and for Boston. Can you talk a little more about that? A: In Boston, the white sportswriters adored Cousy, and the largely white crowds at Boston Garden embraced him; the cheers were louder, longer, and more heartfelt for him than for Russell. At that time, the Celtics were considered Cousy’s team, not Russell’s. That was a lie, at least partially coated in racism, unless you believed it was Cousy’s team, and Russell’s game. These are the facts: In the six years before Russell got to Boston, Cousy’s Celtics did not win any NBC championships. Then, as teammates, they won six titles in seven seasons. After Cousy retired in 1963, the Celtics, led by Russell, kept winning, capturing five more NBA titles in the next six seasons. History has revised the label. Now the dynastic Celtics are known, properly, as Russell’s team. Cousy understands. He knows what happened. “Reality happened,” he says. In 2011, when President Obama awarded Russell with the Presidential Medal of Freedom, the nation’s highest civilian honor, sometimes likened to American knighthood, Russell won the historical narrative of the Celtics dynasty. Q: One big theme in the book is about racial divides in this country, which were especially pronounced during the middle of the 20th century as professional sports were being integrated. What did Cousy say to you about this? A: Cousy sees those years with new clarity. Of course, hindsight helps. He spoke candidly to me about his regrets that, as the Celtics team captain, he had not done more to help Russell against racism he faced in Boston and across the league. Things got so bad for Russell that, at one point, vandals broke into his house, wrote racist graffiti on his walls, and defecated in his bed. Over our many conversations, I began to understand that Russell had become, to Cousy, like a mirror: in looking to his old teammate Cousy saw a reflection of himself, what he had done, what he had not done. Cousy’s regret was palpable during our interviews, and led to his last pass – a mea culpa letter he sent to Russell in February 2016 when we were still conducting our interviews for this book. Q: What does Cousy see when he looks back to those years? A: He sees a lot now that he didn’t see then. He sees how race shaped Russell’s career, and his own. Opposing fans called Russell “BLACK GORILLA!” and “BABOON!” at Kiel Auditorium in St. Louis. In suburban Reading, outside of Boston, white residents didn’t want Russell and his family to live in their neighborhood and white police eyed Russell suspiciously when he drove by. Q: What does Cousy feel he could have done to make a difference? A: Cousy wishes that he’d pulled Russell aside privately and said, “Russ, I’ve got your back. We all do.” And he wishes he had said that boldly in public. He knows the white sportswriters would have printed what he said. But he didn’t do or say that. He also wishes he had participated in civil rights marches with Dr. King, but he didn’t do that. Regret, and more regret. Q: Why was it important for Cousy to write that letter of apology – the “last pass” – to his old teammate? A: He’s closing circles at the end of his life with the people who matter to him most. He closed the circle with his wife of nearly 63 years, Missie, who died in 2013 after struggling with dementia her last decade. He took care of her during those final years in a touching, exemplary way, and still honors her portrait in his house with an occasional kiss. He closed the circle with his two grown daughters, both retired educators, by selling his basketball memorabilia in 2003 for about $450,000 and giving them the proceeds. His daughters remain his devoted support system, though they live far away now. And now he wants to close the circle with William Felton Russell. A: Time is running out. At 90, Cousy is proving that it is never too late to say you are sorry. Cousy is a voracious reader. He reads four or five hours a day, usually alone in his den. He reads biographies, espionage thrillers, and books about race, including Between the World & Me by Ta-Nehisi Coates, and Just Mercy by Bryan Stevenson. Both of those books affected him deeply. He watches the news, and followed the stories about the deaths of black men and youths like Trayvon Martin, Tamir Rice, and Eric Garner. He watched the Black Lives Matter movement take flight. All of this made him reconsider how race had played out in his own life. It’s uncommon for a ninety-year-old white man in America to do that. When Cousy thinks about race invariably that returns him to Russell. Q:You liken Russell and Cousy to the Yankees’ Babe Ruth and Lou Gehrig. Why? A: I’ve often thought that it would have been great if Ruth and Gehrig could have sat down as old men and talked about their seasons together and what their shared success meant. But Gehrig died of ALS at 37 and Ruth of cancer at 53, so that never happened. Q: Was their relationship always fraught? And yet, Russell later would say that his relationship with Cousy had been “remote,” and he was right about that. As teammates, they never had a meaningful discussion about race or their personal lives. In personality, Russell could be prickly and rude, and Cousy, six years older, could be taciturn and a loner. Russell is a man of great intellect, pride, humor, and sensitivity. He will say, “It is more important to understand than to be understood,” and it’s as if he has thrown that cloak of mystery over himself. Auerbach said, “The real Russell is a very difficult man to know, but one worth knowing.” I am certain that is true. The Cousy-Russell relationship, such as it was, didn’t develop in a vacuum. There were powerful societal forces at work during the seven seasons they played together (1956-1963), most notably the tsunami of racial history crashing down upon the nation. The modern black freedom struggle spread across the front pages and on the evening news. Boston in particular had its own fraught racial narrative. But Cousy kept his head down, tried to stay clear of controversy, remained popular, and got a slew of endorsements. Russell – like most black star athletes of that generation – landed relatively few endorsements. Q: How was Bill Russell active in the civil rights movement at the time? A: Russell spoke out against racial injustice. He became involved in the movement. He called out the NBA for its quota that limited the number of roster spaces for black players. After the NAACP’s Medgar Evers was slain in Mississippi in June 1963, Russell traveled to that state and, in a tense environment, led integrated basketball clinics. When the Rev. Martin Luther King Jr. delivered his “March on Washington” address two months later, Russell sat in the front row. He called out Boston for racial discrimination – later termed it “a flea market of racism” – and when the city erupted in violence over busing in the mid-1970s he seemed a truth-teller. Q: But wasn’t Cousy also progressive in his racial views at the time? His mother, Juliette Cousy, unwittingly taught him about prejudice as a child in the melting pot of a Manhattan slum. She and her husband, Joe, were French immigrants. But because of World War I, Juliette hated anything or anyone German. She despised the Germans for what they’d done to France during the War. The young Cousy didn’t understand how his mother could hate an entire group of people. At Holy Cross, a Jesuit college, the young Cousy wrote an undergraduate thesis in the late 1940s on The Persecution of Minority Groups. It centered on Jews, and the Holocaust. Later, he became more attuned to prejudice when he roomed with Cooper, and their friendship deepened over time. In 1953 Don Barksdale became the Celtics’ second black player, and he, too, struck up a friendship with Cousy. When Barskdale was inducted into the Hall of Fame posthumously in 2012, his sons asked Cousy to be the formal presenter, and he was. Q: So, then, what haunted Cousy? A: Cousy feels he should have done more, publicly. 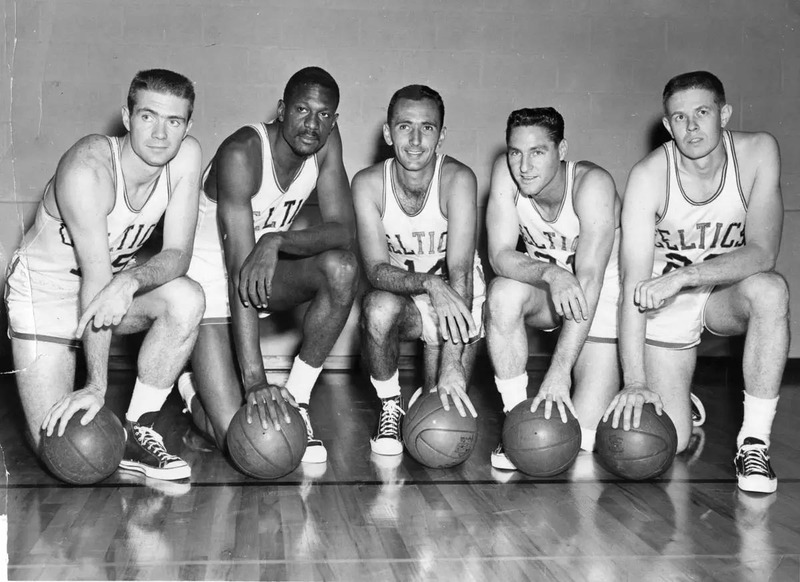 For instance, in October 1961 the Celtics were to play St. Louis in an exhibition game in Lexington, Ky. A waitress at a segregated hotel coffee shop there refused to serve two black Celtics, Satch Sanders and Sam Jones. The black Celtics, led by Russell, met and decided not to play in that night’s exhibition. Auerbach tried, but failed to convince them to play. When their black teammates flew home, the Celtics’ remaining seven white players, including Cousy, played the exhibition. Cousy says he has no memory of this game. He isn’t sure why he doesn’t remember it. But clearly at that moment he wasn’t the fair-minded man he now wishes he had been. That night, he just went with the white crowd. 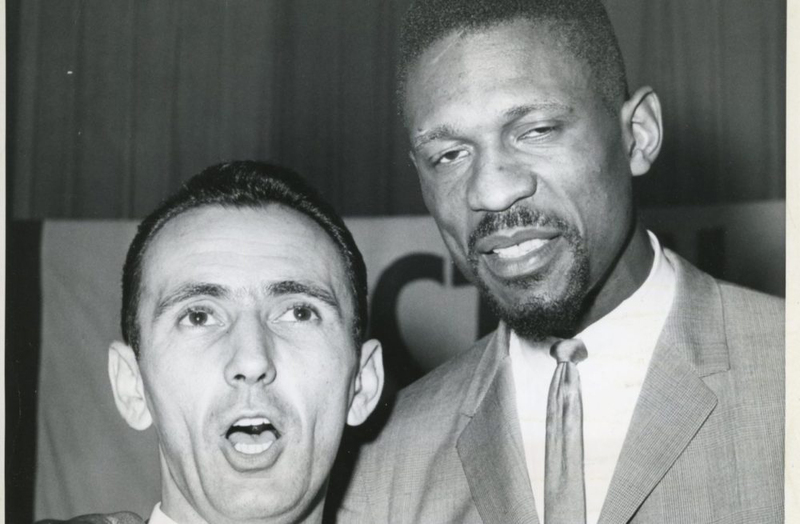 The mistreatment of his black teammates went over Cousy’s head. Now he wishes that he had flown back to Boston with his black teammates. Q: Why does Cousy sharing his story seem so exceptional? Cousy is not doing that. He recognizes his flaws. He’s admitting them, even drawing attention to them. He is not gilding any lilies or embellishing any truths. He is trying to set the record straight: This is who I was. This is his dying declaration: I wish I had done more. Q: On a lighter note, how do you think Cousy and Russell would fare in the NBA today? A: I believe true greatness transcends time. If Fred Astaire were alive today, he’d be a great dancer. If MLK were alive, his oratory would still soar. Cousy and Russell would seize advantage of today’s training methods and diets. Both would do just fine in today’s NBA. Q: Did the way Cousy talked about his regrets resonate with you? A: Absolutely. We all have regrets. We all can look back and see moments when we could have – and perhaps should have – done more, or better, than we did. My interviews with Cousy stirred a memory of a moment from early in my sportswriting career where I surely could have done better. In February 1983, before a tense basketball game between Georgetown and Villanova at the Palestra in Philadelphia, which I was covering as a young Washington Post sportswriter, some fans mocked Patrick Ewing, the Hoyas’ seven-foot star. Ewing is black, and from Jamaica. He’d been the object of taunts that season at other arenas. On this night, some Villanova students held up a bedsheet banner that read, “EWING IS AN APE.” When Patrick ran onto the floor, a banana peel flew from the crowd and landed at his feet. It was horrific. But I didn’t write about it in the next day’s paper. Instead, I wrote about Villanova winning a one-point thriller. How could I not write about the bedsheet banner and the banana peel? What was I thinking as a 22-year-old sportswriter? It took me eight days – eight days! – before I finally took to print about this, and apparently I was the first journalist who had been at the game to do so. To this day I regret not writing on that very night about what remains the most memorable moment of my sportswriting career, a moment when coarse college humor became searing racism. Later I covered Super Bowls, Wimbledons, a World Series, and an Olympics. But that night at the Palestra is the one I’ll always remember. People view sports as a toy box filled with games. Well, this was a night when racism crept into the toy box. All these years later, I couldn’t tell you anything else about that game. 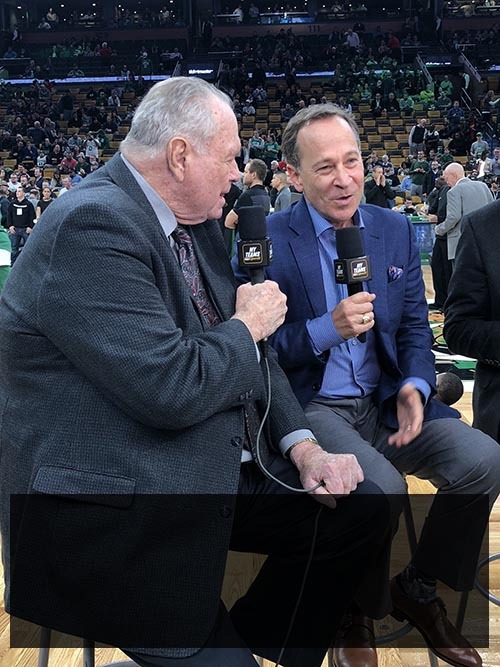 Tom Heinsohn interviews Gary at TD Garden. Bob Cousy meets with today's Boston Celtics. Bob Cousy & Gary on stage at Holy Cross. “Gary Pomerantz just wrote a book called The Last Pass . . . It’s about the legacy of being a great teammate . . . It’s a really deep dive into not only what matters most, but also the NBA as it has evolved and become more inclusive and more progressive . . . It’s an unbelievable read." “The Last Pass” surely stands as one of the most intriguing sports books in recent memory, and maybe of all time." - The Christian Science Monitor. 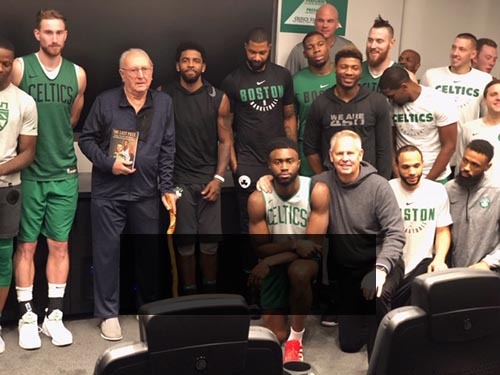 "Gary M. Pomerantz has taken Cooz and Russell and the remarkable Celtics and fashioned them into a fast break of a book . . . [It is] an important statement about America's social consciousness a half-century ago, and our own today. But it is also a dual biography of the two men who dominated Boston sports at a time when the Red Sox were pitiful, the Bruins even worse and the Patriots unworthy of discussion in polite company." "The Last Pass" does what has become frighteningly rare in sportswriting: it hypnotizes you with a great narrative . . . It's absent the glut of analytics and metrics, and dives deep into the human drama of the relationship between two men at the core of one of the great ensembles in American sports history." - Michael Wilbon, co-host, ESPN's "Pardon The Interruption." "A revealing new look at the Boston Celtics' Cousy, Russell and Auerbach era. It's not all cigars and championship glory stories . . . Civil rights and racism remain at the forefront of issues the country faces. It's those topics that make The Last Pass more than a book about a sports dynasty. The story Pomerantz tells resonates now because the United States still hasn't figured out race and equal rights. " "Just superb. Tremendous . . . I've read a lot of them: Top three or four sports books of all time, this book." "Pomerantz explores the complicated relationship between Russell and Cousy, both superstars but playing in a world where pervasive racism diminished the contributions of one man while elevating those of another. 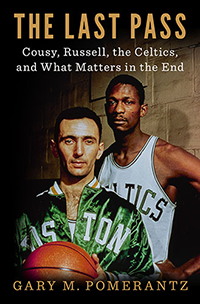 Cousy sees this dynamic now in a way he didn't then, and his reflections on what happened to Russell and the inadequacy of Cousy's response drive this poignant memoir, the lessons from which extend far beyond sport." 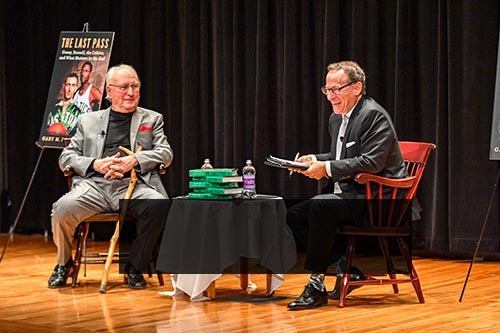 "Do yourself a gigantic favor and grab “The Last Pass,” a new book by Gary Pomerantz in which all-time great Bob Cousy reflects on his life, and, especially his relationship with Bill Russell. Some astonishing revelations from a very introspective, emotional, intelligent man." "Students of NBA history are in awe these days, marveling at the depth of Gary Pomerantz’s new book. The Last Pass explores the fascinating relationship between Bob Cousy and Bill Russell, two very private and intensely competitive men who anchored the Boston Celtics’ dynasty in the late 1950s and early ’60s. Pomerantz is a master of exquisite detail. He has produced two of the finest sports books ever written, on Wilt Chamberlain (“Wilt, 1962”) and the Pittsburgh Steelers’ dynasty (“Their Life’s Work”). For fans of the Warriors, trying to become the first team since those Celtics to reach five straight Finals, there is invaluable perspective on how a great team sustains its brilliance." "Could Cousy have changed the way the civil rights movement played out in Boston if he had spoken out against racism? Why didn’t he do more? What really passed between him and Russell? Instead of coming off as Cousy’s guilty conscience, seeking absolution for his sins, The Last Pass is instructional concerning the way that an individual can publicly apologize." 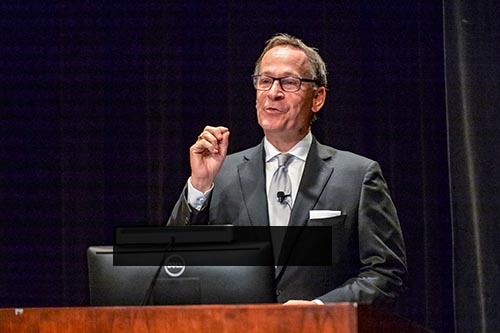 "Gary M. Pomerantz is staking his claim as the new Halberstam. This new voice had slipped onto the sports scene with WILT, 1962 amidst the wave of reflection that descended upon the hoops world following Chamberlain’s sudden passing in 1999 . . . The same keen eye is at work in his latest effort." "The Last Pass” offers a compelling portrait of one of the greatest players in NBA history . . . What Pomerantz has done is mine Cousy’s story thoroughly and meticulously; these interviews unfolded over the course of years, allowing for a degree of detail and nuance that borders on the staggering. . . . No hagiography, “The Last Pass” uses Cousy’s story to reach deep into the fabric of the culture itself. The nascent NBA is used as a lens to view larger truths about mid-century American society. Cousy’s desperate yearning to set things right with Russell is a reflection of a country that still struggles to come to terms with the sins of years gone by. Cousy was known for his ability to get his teammates the ball, but in “The Last Pass,” it’s Pomerantz who dishes the assist, allowing the Houdini of the Hardwood to score once again." – Chuck Klosterman, author of But What If We’re Wrong? “Eloquent…. Pomerantz tells a moving story of a pivotal time in basketball history."